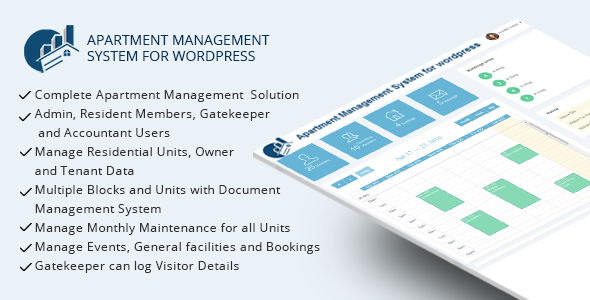 Apartment Management System for wordpress plugin is ideal way to manage complete housing society or neighborhood maintenance tasks. It has different user roles like Admin, Resident members, Gatekeeper and Accountant Users. - [Feature] Can set maintenance Charge for each member. - [Feature] Auto generate maintenance invoice. - [Feature] Add tax feature in invoice. - [Feature] Added bootsrap datepicker. - [Feature] Added file upload validations for front-end users. - Fixed count issue on dashboard. - Fixed checkout button issue in visitor management. - Fixed issue of building units structure. - [Feature] Member can make payment using paypal. - [Feature] New Payment Label: Partially Paid and added remaining amount column. - [Feature] Administrator can send message to only one Building block. - [Feature] Member can add notice or events. - Member can view own invoice.